KBTalking Red switch with cross style stem. Similar to Red Cherry MX in function and feel. Not a great typing switch. But, it's insanely smooth. Much, much smoother than the Cherry equivalent. 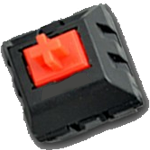 Have experience using KBT Red switches? Add a review to share your knowledge with the keyboard community.